So it took a liiiittle bit longer than expected, but The Wars of Other Men is out on DVD now! Go buy it on Amazon (https://www.amazon.com/The-Wars-of-Other-Men/dp/B071G7MVDL) and revisit our interview with the lead actor Scott Norman! 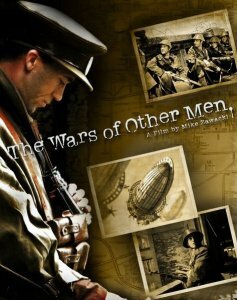 The steampunk/dieselpunk tale The Wars of Other Men comes out on DVD this month. We talked with Scott Norman, who plays the film’s nameless main character, about the life of an actor, being a black geek/nerd and “steaselpunk” (TM Scott Norman). If you’re in or near New York City, Okwui Okpokwasili’s Bronx Gothic is the subject of a documentary film of the same name by Andrew Rossi and is having a two week run at Film Forum (209 W. Houston St., New York, NY 10014) from Wednesday, July 12, through Tuesday, July 25, 2017. Check out the interview we did with Okwui when she brought Bronx Gothic to the Contemporary Arts Center last year. New York artist Okwui Okpokwasili brings her one-woman show, Bronx Gothic, to the Contemporary Arts Center this week. Midwest BSFA talked to the writer/choreographer about combining elements of the Victorian Gothic and West African storytelling, and exploring the concepts of darkness and innocence in her work. This list of women of color who write horror includes Nuzo Onoh and Tananarive Due. Check it out! It’s September and for me finally the beginning of the creepy season, huzzah! I’ll just ignore that last small heat wave this week, go away please summer, I have my tea and candles and creepy reads ready! I have a lot of books on my tbr that fall under speculative, horror and mystery, but I’m also working towards seeking out and supporting more women writers of Color. I’ve chosen horror because it’s a genre I’ve been wanting to explore more and because, like science-fiction and fantasy, horror can offer women of Color a space in which to disturb social conventions and transgress boundaries. Can’t wait until this movie comes out next February. The trailer had me shook and not in a good way. This articulates why. “Every Black American is bilingual. All of them. We speak street vernacular and we speak job interview.” – Dave Chappelle, 2005. When I went to the National Museum of African American History and Culture, I saw this quote hanging on the wall with lights shining on its message. As I stood there reading the quote, I remembered the first time I heard Dave Chappelle say this; it stuck with me for a time because of the deeper meaning behind it, a meaning that goes farther than just language. Being black in America, you’re taught early on that you will always have two faces; one for your friends on the block and one for the world that doesn’t know you personally. Join us at the Detroit main library next Saturday, Sept. 17! In a dream world, #MECCAcon2016 would be filled with cosplayers as DOGONS, EGUNGUN, WITCHDOCTORS, VOODOU, BOBO MASKS, IGBO MASKS, etc. I’d honestly smile from ear to ear in gentrified Midtown Detroit, lol. So… What exactly IS cosplay? Now…. What is MECCAcon cosplay? The Dieselfunk Anthology is Available Now! Get your dieselfunk anthology NOW! Marcus Garvey, Noble Drew Ali, Zora Neale Thurston, the Tuskegee Airmen, the Triple Nickles, Jazz and the Harlem Renaissance. These people and things – and much more – are what make Dieselfunk hotter than fish grease on a Friday in July! Get in on the hotness and take an amazing ride with Day Al-Mohamed, Shawn A. Cosby, Milton Davis, Malon Edwards, Joe Hilliard, Ronald Jones, Carole McDonnell, Balogun Ojetade and James A Staten as they add a funky twist to the Dieselpunk genre. The Dieselfunk! anthology fills a void common in most speculative fiction genres, providing a much needed voice from and African/African Diaspora perspective. Dieselpunk just got funky!